Saturday this week saw me in the Sheldonian singing about sheep along with about 150 other people. As this coincided with several meetings my dad had in and around Oxford on Friday, he and mum came down for the weekend arriving on Thursday night, and C and I took Friday off to spend with mum. 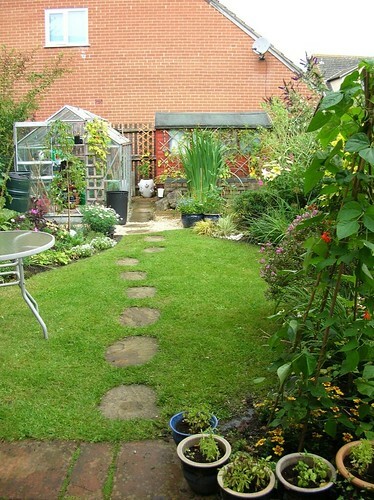 The plan was to do some serious gardening with my mum acting as consultant whilst we put in a new bed at the front of the house to differentiate our front garden from the (shall we say) somewhat unkempt front lawn of our neighbours. 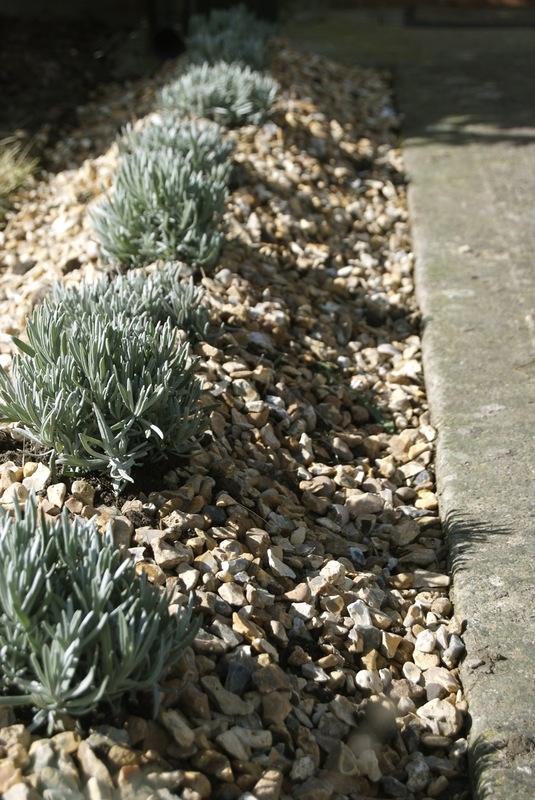 In spite of a wet start most of Friday was beautiful gardening weather and we made good progress so that the path to the front door is now lined with a proto-hedge of lavender mulched with gravel. Lots of digging which was pretty tiring* but we were pleased with the result. 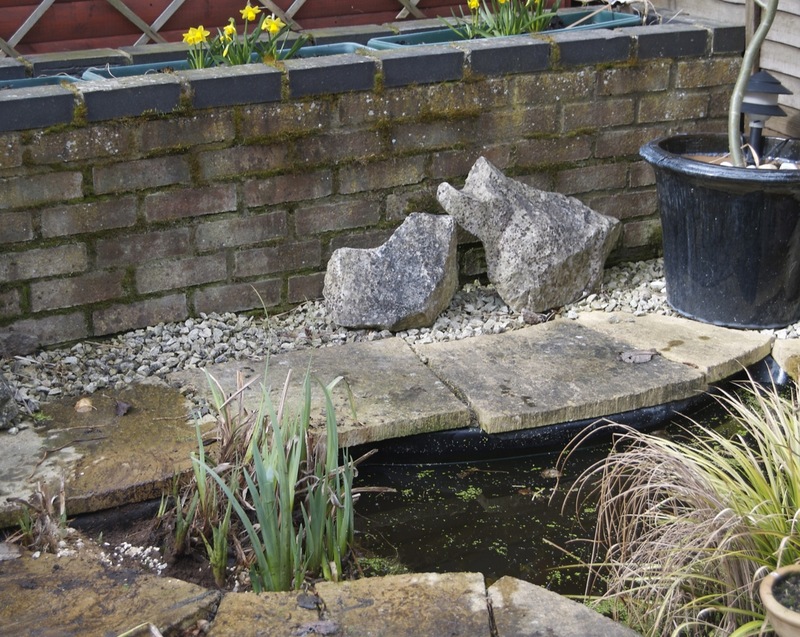 Egged on by mother, from whom I have inherited my gardening philosophy of "Oh what the hell, try it; if it dies you can always plant something else", we also finally plucked up the courage to split the flag iris that has been threatening to engulf our little pond completely. It is no doubt completely the wrong time of year to do this, but it seemed like the only practical alternative, since later in the season the wretched plant is so big it's practically impossible to get the spade into it. This is it last summer (at the end of the garden in front of the shed). It was as tall as me (probably taller) and filled fully half the pond. After the flowers finished it all fell over sideways and filled the rest of the pond as well. This is it today in its considerably reduced condition. Fingers crossed that it doesn't turn up its toes! I did feet a bit sorry for the large family of frogs we had to evict in order to do this. They all took refuge next-door, from where we could hear them croaking reproachfully as we attacked their erstwhile home. Gardening aside, my weekend was mostly taken up with singing. The concert went well, although once again it confirmed the Sheldonian's right to the title of "Most Uncomfortable Arts Venue in Britain" which it was awarded a few years ago. Two people fainted in the first half; there may have been a third but opinion was divided as to whether he was just lying on the floor because he could no longer bear sitting on the narrow planks which pass for seats. Still it's a good place for a standing ovation - everyone's always so glad to have an excuse to get up! Unfortunately for me the unsuitability of Wren's masterpiece for concerts had dire consequences. Conditions for the performers are not much better than they are for the audience. There are only two dressing-rooms - long, narrow, corridor-like affairs in the basement, each about two metres wide and 12 long. In this space all the members of the 150+-strong choir and most of the orchestra are supposed to change and leave belongings. Needless to say the place is like rugby scrum after the concert with people trying to get in and out and others trying to change at the same time. * C tried manfully to get out of it by finding excuses to be called into work on on two separate occasions, spending a good 3.5 hours of his day off in the office, but he finally relented and came back to help us with the serious digging. That would be great. I must have another go at arranging a weekend knit-in for the Blue Stockings sometime soon. Perhaps when the weather's a bit better.